Look to the Cookie! Or the rice crispy treat. Same diff. | Food E.
Look to the Cookie! Or the rice crispy treat. Same diff. Inspired by Molly at lv, molly I decided to whip up some rice crispy treats. I loved Smitten Kitchen‘s high-brow take on the standard treat but I’m a little more old school myself. A little more old school, and a little more “how many delicious dessert ingredients can I add to this to make it even sweeter than it already is.” And I love anything that combines chocolate and vanilla. This is what I came up with. *You’re making 2 separate types of rice crispy treats here that will be joined in sweet matrimony by a layer of melted chocolate. So you’ll need two separate pots. Dig? Procedure: In each pot, melt half a stick of butter. In Pot #1, add half bag of marshmallows and stir until melted. Meanwhile, add cocoa powder, vanilla, and salt to Pot #2 until fully incorporated; add marshmallows to Pot #2 and stir until melted. 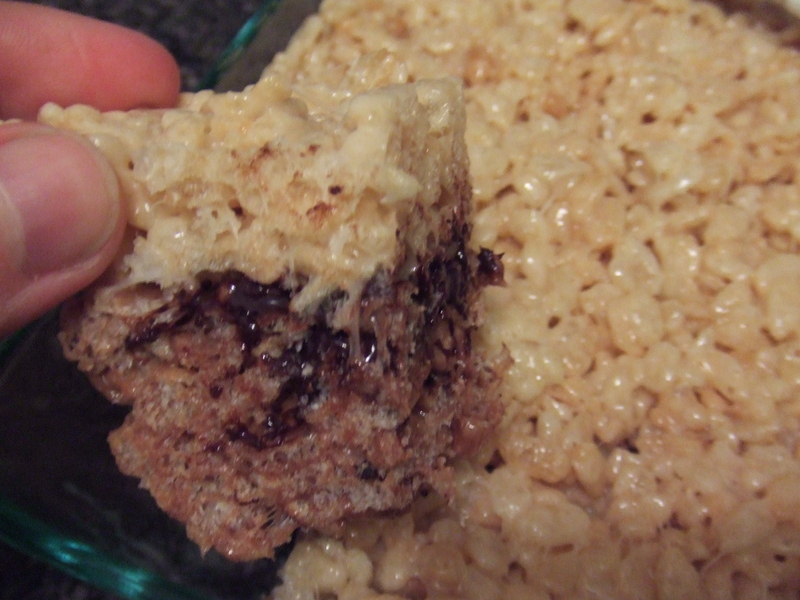 In a double boiler (or the microwave), melt the bittersweet chocolate. Assembly: Spray an 8-inch cake pan with non-stick spray. Spread contents of Pot #2 into the pan. Press the mixture down with greased up fingers (I sprayed my fingers with the non-stick spray and it worked brilliantly). Spread the melted chocolate over the first layer, covering the entire layer. Next, spread the contents of Pot #1 over the still-warm melted chocolate, starting with a heap in the middle and using greased up fingers to press the mixture outward, careful not to mix the melted chocolate into the white layer of your treats. Let cool. Cut into squares. Ingest. Enjoy. a truly brilliant idea. i’m excited to try these next!